Welding and grinding - ITB Engineering & Production s.r.o. We offer welding of classical steels, but our specialization is welding stainless steel. 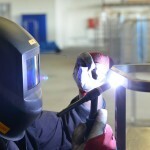 We provide point welding, TIG welding and MIG / MAG welding. Due to subsequent grinding with quality tools, our products meet the highest quality requirements.